It’s Friday night. You’re in the back room of a comic shop, or a specialty game store, or the final hours at your local library, or your mother’s kitchen table. You look over your cards and back at your opponent. What do they still have in their hand? Is your strategy still worth sticking to, or would a riskier gambit net you victory sooner? You check and double check the cards on the table. One card would win it all, you draw. Finally, you have the other half of Ranma Soutome, changing his stats just enough to get a charm victory. You then argue with your friend for an hour because you have conflicting rulesets. 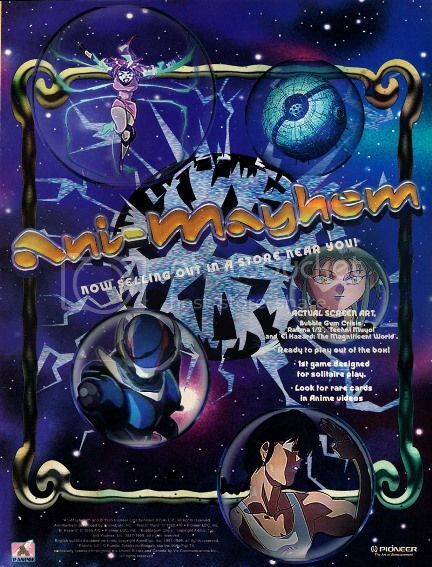 The year is 1996, and you’ve foolishly decided to change up your anime night with your friends to play the anime themed trading card game, Ani-Mayhem. I have a fair amount of these cards from a youth mired in Magic: The Gathering. TCGs were affordable fun for the tweens and teens of the nation, and like most nerdy pursuits there was plenty of overlap. Many candidates were from table top board games, like Spellfire from a Dungeons and Dragons setting and Jyhad, also known as Vampire: The Eternal Struggle, based on the World of Darkness system. Pokemon wouldn’t be fielded by Wizards of the Coast until 1999, but for a brief period of time to have a marriage of anime and TCGs your only choice was this mutated love child of Upper Deck and Geneon/Pioneer. 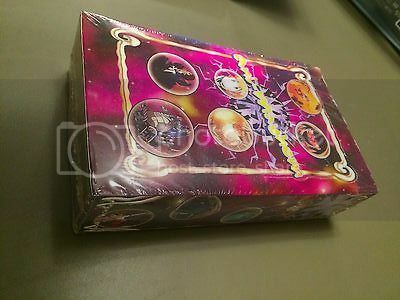 Oh unopened boosters on eBay, what secrets do you hold? This was about a year away from when you could say anime was hitting mainstream markets. 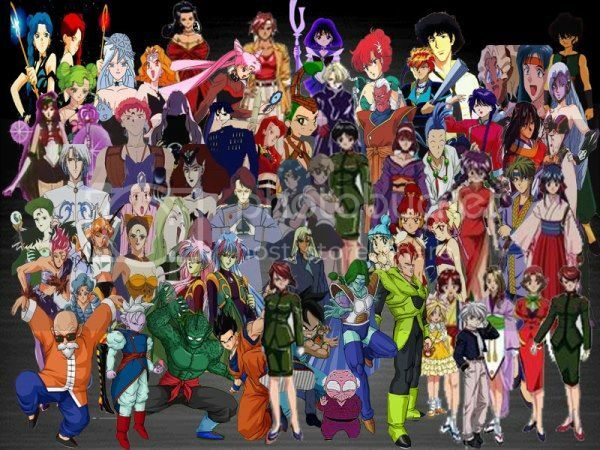 The original Dragon Ball hadn’t drawn any numbers in 1995, Sailor Moon was being slotted in dead show slots like 7:30am (And I should know, I would tape them for my sister), Toonami wouldn’t premiere for another year and Dragonball Z wouldn’t show up until a little after that. But Upper Deck had some experience in TCGs with Gridiron Fantasy Football and Pioneer was pushing for more licensed physical product exclusively for American markets. Pioneer Animation tapped a group known as AnimeCafe to produce the game mechanics and art design. Information on this group is scarce save for the names of its members, but three people had the task of producing something to play in the same ballpark as the dominant Magic: The Gathering. Good, clean American fun that you can totally explain to mom! In a way this game is a love letter to crossover fantasies held by fanfiction writers from the dawn of anime fandom in general. The story for this meet up is the multiverse is combining/collapsing and various anime characters must unite together to bag as much swag as possible before everything sorts itself out again. 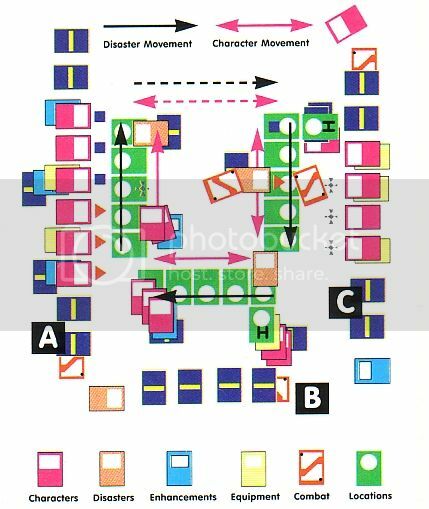 Touted as a game that could be played solitaire, and for various reasons this is possibly the most appealing way to play the game, cards are stacked in a kind of board formation in which a party of your anime heroes will romp through interesting locations then fight and charm your way out of disaster after disaster until you claim an item. Have the most items at the end of the game you win (Or have at least five items before your party dies in a solitaire game). To defeat your foes or hinder your opponents you have power cards that usually mimic an ability you would find in an anime such as certain character special attacks, one use items and equipment. And combat was particularly interesting because it was a deck on its own where each card had two uses for each type of combat you went through in a round. If only there was some way to make all of these characters go on adventures… TOGETHER! But how? But somewhere between concept and ruleset something went wrong. 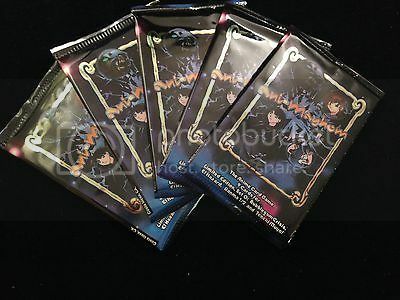 The original rules had to be changed within the first few months of printing, leading to a completely new set handed out for free when the second series of cards was released. Errata questions flooded the magazines and mail rooms of Pioneer USA. The cards themselves seemed to have everything you needed to play something, but there was much left unclear in the ruleset that led to a complete stop of the game. And that was provided you could find a game to begin with. Anime was still a few years away from becoming an economic powerhouse so finding someone who not only liked TCGs and anime was a hard prospect. Just a tad overwhelming for the uninitiated. Luckily there were the solitaire rules, but with the rise of the internet solitaire style tabletop games really fell out of favor. From the late 70s to the early 90s there was a market for solitaire and play by mail style games. They included many Avalon Hill war games and several Games Workshop titles were single player. They were a haven for families that didn’t have an expensive home computer for advanced board game products. Because of their short lifespans such games are usually regarded as collector’s items amongst board game groups. Bragging about being the first TCG you could play by yourself wasn’t a great selling point by the mid-90s. There were way too many cards with tie in powers to specific cards. Good for fans, bad for game flow. But fun is fun and with friends any game can be enjoyable. I’d keep a few decks on hand for my anime minded friends to play as a break from watching VHS tapes into the wee hours of the morning. And keeping all the cards my own was pretty helpful because with multiple players it would have been tough to determine who actually owned which card. With cards moving all over the board it was a real mess to pick up after a session. Personal card sleeves really wouldn’t get into fashion until later, so mix ups would be inevitable unless you had the house rule of “Only move into your own locations”. But finding another Ani-Mayhem player was hard enough. I recall having to get creative with one of my friends. 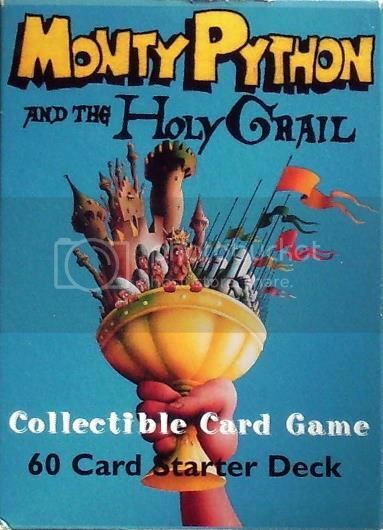 He collected the Monty Python and the Holy Grail TCG and no one else played that. So we combined the two into “Graily-Mayhem”, hammering out the awkward rules into a pleasant time. It kind of worked because both games had a kind of traveling mechanic as well as cards used as a sort of board. For all the problems we may have had with the rules or even finding other fans of the game, the anime they chose to be represented in the game were spot on attractors. 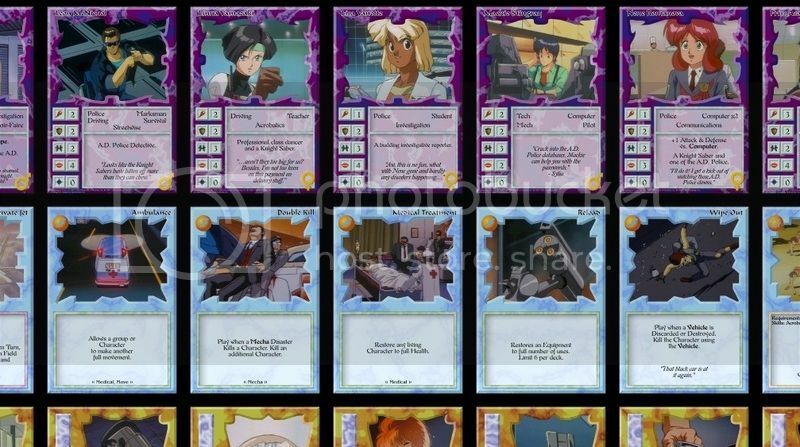 Even if you weren’t in it to play, collecting the cards was a step up from many of the small trading card sets from other productions based around anime. And Pioneer was at the height of its anime producing power then. In the first set they lined up Bubblegum Crisis, El-hazard. Ranma ½ and Tenchi Muyo! to provide a variety of anime genres to choose from. The second set was more a marriage of Pioneer and U.S. Manga Corps with Armitage III, Dominion: Tank Police, Oh My Goddess!, Phantom Quest Corp., and Project A-ko. I like the nod to Ryoga’s perpetual lost state with the arrow in a circle. The final set was supposed to be the definitive version of the game. It was designed entirely around Dragonball Z which was really pushing anime into a wider view. The rule set was finalized. They had a great reveal at numerous board game conventions. But they committed one mistake that sealed the fate of the Ani-Mayhem card system forever. The set was completely out of balance with the older editions. One Goku out performed any other single character from the previous set three fold. Just about any Dragonball Z card would crush any older edition. In order to have Tenchi Misaki have a chance to compare to a DBZ character’s stats he needed six cards attacked to him. Several were rare, so accomplishing this would have eaten a lot of booster packs that were outdated by then. New mechanics for transformations based on the moon worked for a straight DBZ game, but with the old transformation rules still in play it led to even more confusion on the playing field. Finally they added a new victory condition. 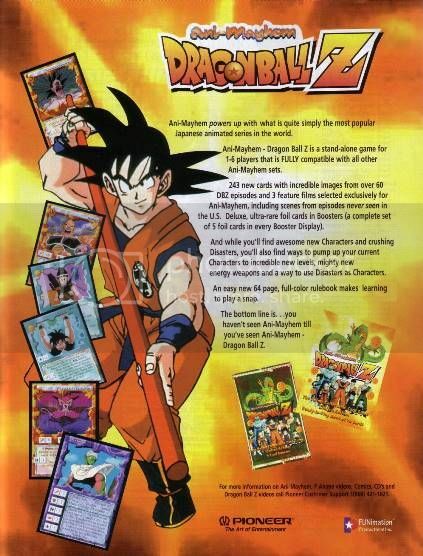 Collecting seven dragon balls wins you the game, but they were one of the more common item cards in the set with one card netting you up to three balls at once. All this power level crap was settled in ’97. Seems Goku beats everyone. After a little over a year and a half, Ani-Mayhem was no more. Anime fans know a lot about the story of Pioneer. They survived, got reorganized, made a nice little lasting impression on the industry. Upper Deck learned much from producing the cards, and years later brought the multi-licensed VS System trading card game series based on Marvel and DC comics. AnimeCafeInc hasn’t been seen or heard from again. But that’s life in the card game business. Ani-Mayhemwas a first in many ways. It was the first solitaire trading card game and the first anime based trading card game (Barring a test game made by Animeigo the same year). It also gave fans like me something beyond the scraps of anime series being trickled over to enjoy with my friends in the fandom. And making something enjoyable is always something to be proud of. Dean The Adequate entered the contest in Inquest #27 to make your own Ani-Mayhem cards. I based mine on the “Dirty Pair” and actually won one of the ten runner-up prizes. Unfortunately it took them a while to send out the prizes, so they packed in some extra stuff. I received a PAnime keychain with Ryo-Oki, Mousepad with Ryo-Oki, Ryo-Oki pin, Tenchi group T-shirt, a booster pack of the card game, and due to the lateness of the prizes an additional pack of cards and one of the brand new DBZ card boosters. 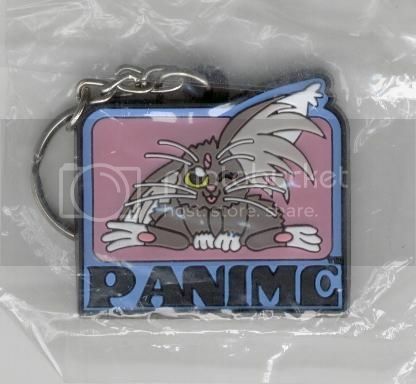 If you know my history with Tenchi Muyo you know what I did with most of the merch… I gave it to a friend that was actually a fan of the show. I’m not burning perfectly good rare anime product in the US in the 90s. Any anime swag was good anime swag back then. If you’re interested in this card game www.ani-mayhem.com is a complete source for everything you could ever want to ask about it. From card lists to ways to play the game, this is not just your first stop, but probably your last for anything you need to know. I’d like to give a big thank you to Ryan Richards for this resource.